Told in three part, the movie begins in 1957 and ends in 1964. 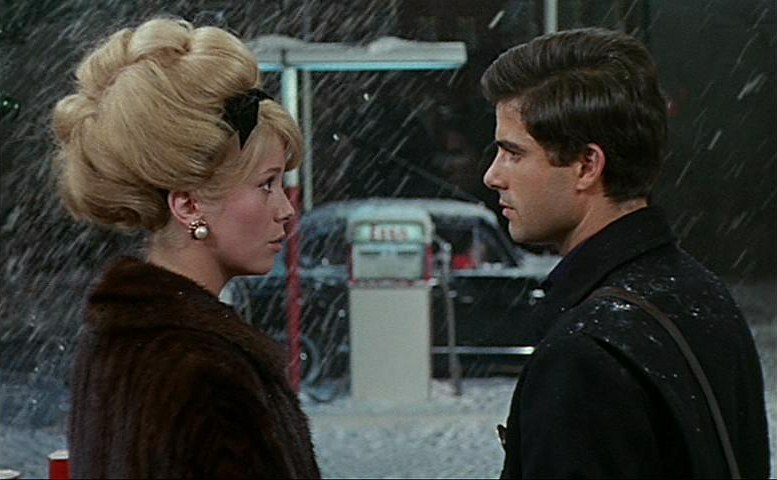 Performed much like an opera where all the French dialogue is sung, 17-year-old Geneviève (Deneuve) is in love with 20-year-old Guy (Casteluovo) who works as a mechanic. Geneviève’s helps her mother (Vernon) run an umbrella shop in Cherbourg, France. Her mother objects to them getting married because they are too young. Guy is drafted to fight for two years in the Algerian War. While he is gone, Geneviève finds she is pregnant with his child. Her mother works to convince Geneviève to forget about Guy and to marry a more wealthy jewel dealer, Roland Cassard (Michel). -Different from American musicals, there is no dancing and no show stopper song. If the lines were not all sung, it would be just a normal drama. -The color is very candy-coated and gorgeous. Costumes of the actors match the brightly colored paint, wallpaper and decor. -The scene where Roland and Geneviève sit across from each other at the dinner table. As they speak to one each other, they look straight into the camera and speak. -Pregnant Geneviève in a white wedding gown, looking very unhappy. -The 1960s fashions are gorgeous and as colorful as the backdrop. 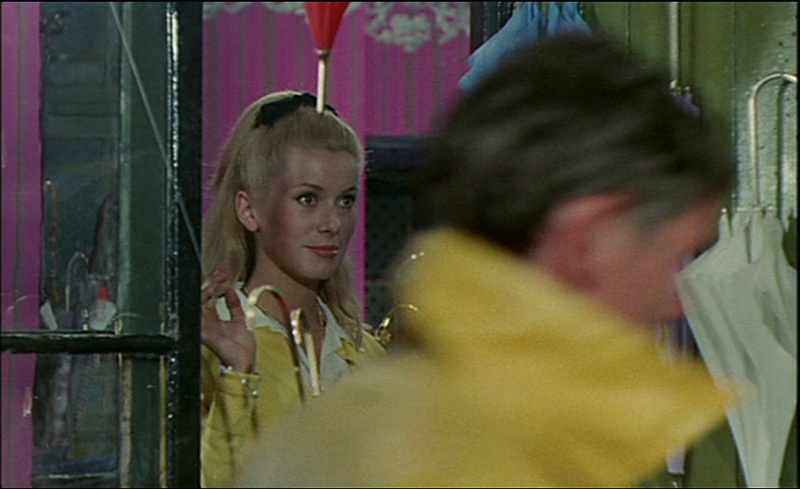 -“Umbrellas of Cherbourg” follows the Jacques Demy film “Lola” (1961). 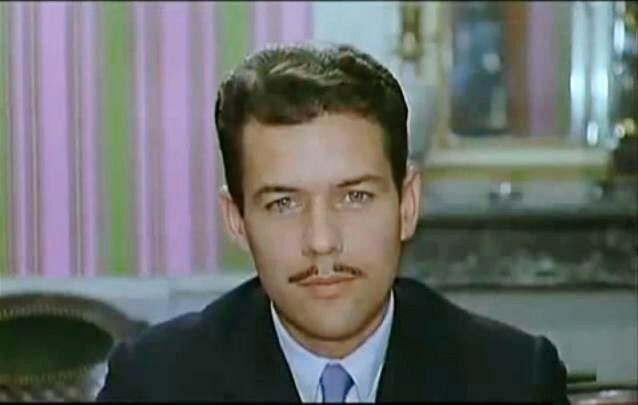 The character Roland Cassard is in “Lola” and in “Umbrellas” sings about a woman he once loved named Lola and how she broke his heart. -An English stage version was adapted in 1979. -Each scene and scenario has it’s own song. The tunes are a mix of jazz to ballads. -The most popular song from the film is “I Will Wait for You” sung by Geneviève and Guy before he leaves on the train to join the military. 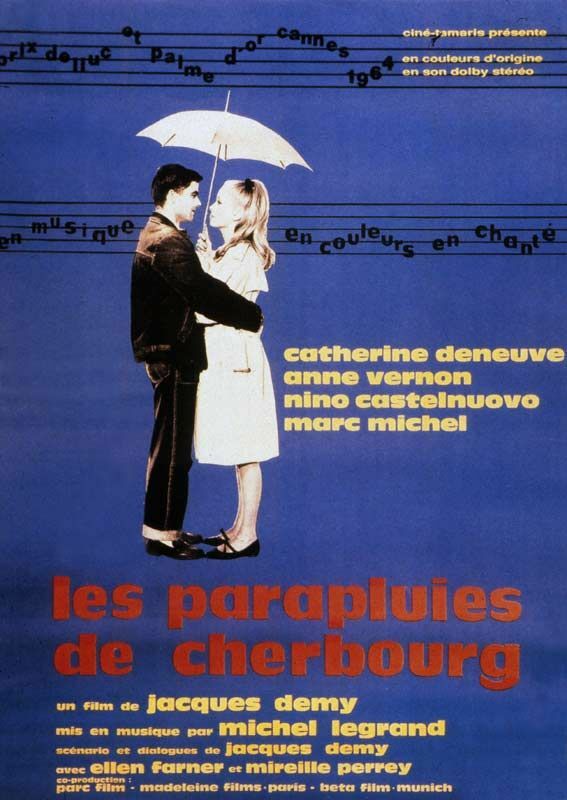 “Les Parapluies de Cherbourg” is one of my favorite musicals-up there with my all-time favorite “West Side Story” (1961). 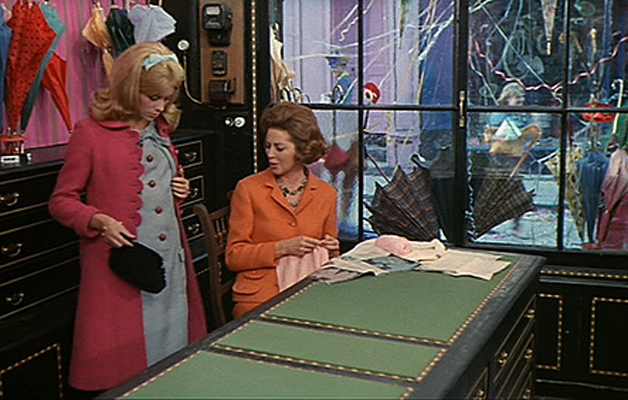 I love the gorgeous candy-coated color, the costumes and the heart wrenching sadness. The story line is simplistic but doesn’t have the normal happy ending that an American 1950s or 1960s musical may have. Don’t let the subtitles and all singing throw you off, you won’t regret giving this musical a chance. Genevieve is pregnant with Guy’s child and Carnival is going on outside. The young lover, both married, meet again after five years. 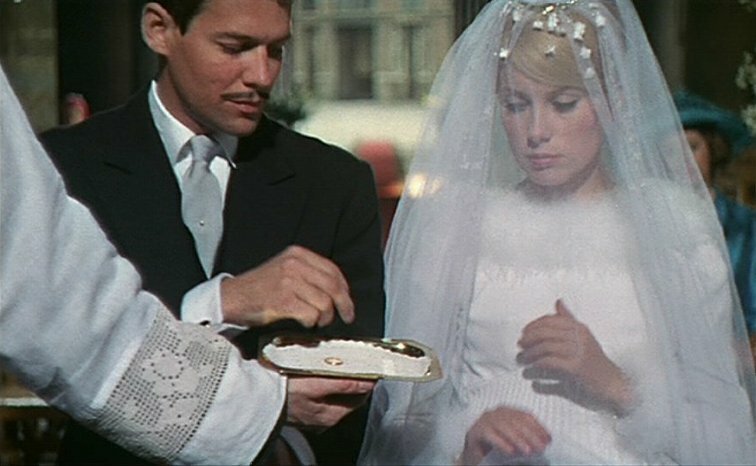 This is part of the Summer Under the Stars blogathon for Catherine Deneuve Day. 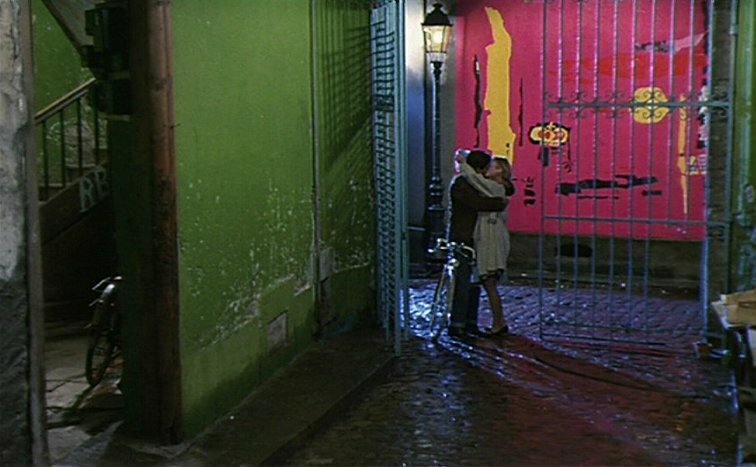 This entry was posted in Musical Monday and tagged Catherine Deneuve, French Film, Musical Monday, Summer Under the Stars, Umbrellas of Cherbourg by Jnpickens. Bookmark the permalink. This is one of my all-time favorite movies. I took two French classes when I was in college and my professor had us watch this movie in one of them. We watched it a little bit of a time over several classes, which really isn’t an ideal way to watch a movie, but it still made a huge impact on me. Those vibrant colors, the haunting theme song, the heartbreaking ending, there’s no way I could have ever forgotten that movie. I think it’s the only movie I ever had to watch for a class (a non-film related class anyway) to make that kind of impression on me. Excellent pick for Musical Monday. The ending of this is spectacular. One of my favorites as well– though I’d admit I still love Young Girls of Rochefort a bit more. I think Umbrellas is such a wonderfully offbeat sort of poetry that it’s hard to forget, and god knows I’ve been in a relationship that felt like the one in the film. Sad stuff, but so beautifully portrayed. I saw this movie in a film class a few years ago and was surprised to hear a song (“I Will Wait for You”) that I had first heard on a Petula Clark album many years before. It’s a beautiful musical. Great post! I wasn’t a fan of this musical to be honest. I got frustrated with the all-singing aspect pretty quickly. But the film is gorgeous! I want to go back to it one day and give it another chance. I actually haven’t seen this one! But it looks absolutely beautiful. Adding it to the list. Thanks again for a great contribution to the blogathon.